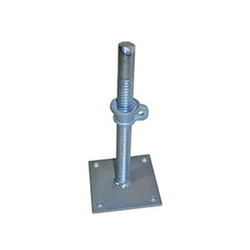 Exporter of a wide range of products which include solid base jack and hollow base jack. Our vast technical excellence has enabled us to manufacture highly demanded Solid Base Jack. Widely utilized for construction applications in various industries, this base jack is suitable for all types of scaffolding and formwork systems. Equipped with malleable cast iron cup nut, the offered jack can be availed with 150 x 150 x 6 or 120 x 120 x 5 mm plate size.